The Right Reverend David Edwards was born and educated in Shropshire, England. He studied at Loughborough University and Homerton College Cambridge and worked as a high school history teacher prior to completing diplomas in Religious and Evangelism Studies followed by a Masters of Arts in Applied Theology at the University of Kent at Canterbury. 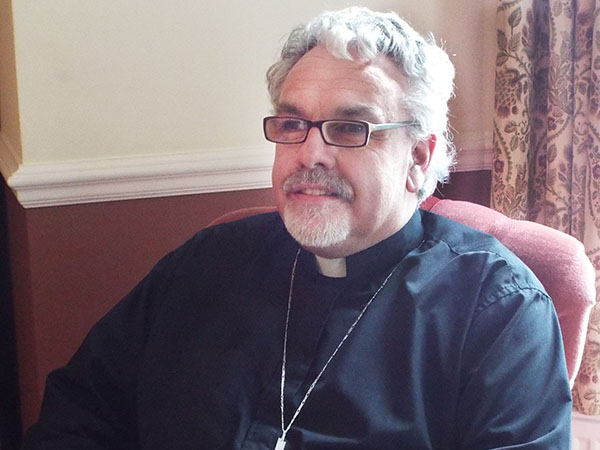 Both prior to and following his ordination in 1995, Bishop Edwards served in ministry in the Chelmsford Diocese in England, including as Bishop’s Advisor in Evangelism and in the Parish of High Ongar. He moved to New Brunswick in 1998 to be Principal of Taylor College of Evangelism. He has also served in parishes in Saint John and as Parish Development Officer for the Diocese of Fredericton. In 2014, he was elected coadjutor bishop in Fredericton and, subsequently, installed as the tenth Bishop of Fredericton. He also currently serves as Vice-Chair of Safe Harbour, Saint John Youth House Board.